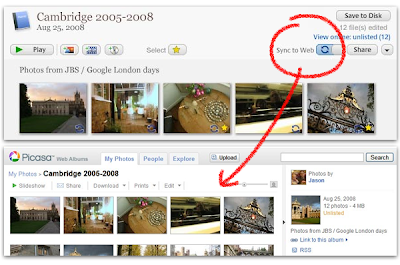 Picasa Blog: Announcing Picasa 3.0 and a new version of Picasa Web Albums! Announcing Picasa 3.0 and a new version of Picasa Web Albums! Today, we're pleased to announce the public beta of Picasa 3.0, the next generation of Google's photo management software. We're also launching a redesigned Picasa Web Albums with a brand-new 'name tags' feature, which gives you the power to quickly label and organize your photos based on who's in each picture. From the start, Picasa's goal has been to help people get more from their digital cameras. Earlier versions of Picasa focused on supporting users at every critical juncture in the digital photo lifecycle -- making it easy to import, organize, edit, print, and (since the advent of Picasa Web Albums) publish your photos online. 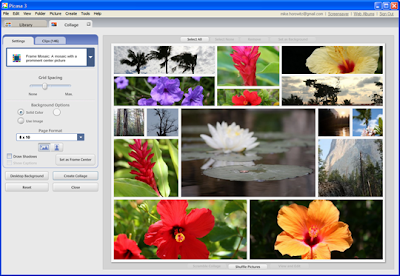 Unlike piecemeal alternatives, Picasa manages all these things inside a single application, and with a consistent, easy-to-use interface. Fast-forward to today, and a few things have changed. Sharing online has skyrocketed in importance, as more of us develop a network of friends and family who are tuning into our pictures. Online availability also matters more as we start to use our phones, TVs, and wifi frames to deliver our photos. And as users get more experienced, they're demanding more creative ways to remix, enjoy, and distribute their photos. We've therefore brought the Picasa software and Picasa Web Albums much closer together, breaking down barriers between your home PC and your online albums. New controls in Picasa 3 make it much easier to quickly upload photos, and we've added a new 'sync to web' feature that automatically updates online albums when you add or edit photos on your computer. That's just the start. Picasa Web Albums now includes a new 'name tags' feature that helps organize your growing photo collection by people. Opt-in to name tags, and our technology automatically groups photos containing similar faces. Instead of asking you to painstakingly label pictures one-by-one, name tags lets you rapidly tag many photos at once. By doing so, you can easily find that photo of your cousin from two years ago; create a slideshow of you and your best friend, or share an album with everybody who appears in the photos. Take a look at this video to see name tags in action. There's much, much more. This blog posts only scratches the surface of what's new in Picasa 3 and Picasa Web Albums - an Explore page featuring recent photos from all over the world, the ability to email photos directly to your online albums (great for mobile phones), Creative Commons licensing, and numerous interface refinements. And we haven't event mentioned the compelling new creative tools inside Picasa 3, like a new movie maker, totally-revamped photo collages, a powerful retouching tool, text tool, and more. Check out the video after the post for a complete overview. We'll be exploring more of what's new in Picasa 3 (beta) on this blog tomorrow. And over the next couple weeks, we'll have daily posts to help introduce you to some of our favorite new features on Picasa Web Albums and inside Picasa 3. Picasa and Picasa Web Albums are unique in how they work together to make it easier for you to manage your photo collection -- on your computer, or on the web. So get started, have fun, and let us know what you think!